In 2012, manager Bobby Valentine of the Boston Red Sox talked late in the baseball season about what changes he was planning for his second year on the job. After all, the first one had gone badly – so badly, in fact, that no one else thought he’d get a second year on the job. Did he know something about his future, or was he putting up a good front? It didn’t matter. Valentine was fired the day after the regular season ended. 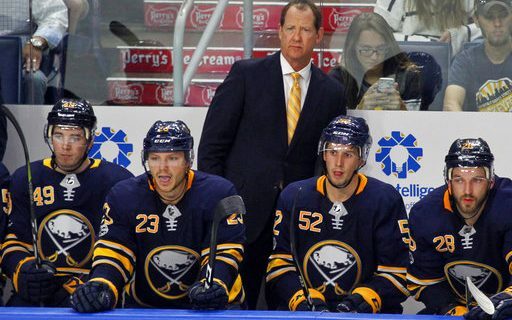 In 2019, coach Phil Housley of the Buffalo Sabres talked late in the hockey season about how he expected to be back for his third year on the job. Again, many outsiders thought his time here as a coach had run out. Did Housley know something about his future, or did the circumstances dictate the public answer to that question? Ultimately, it doesn’t matter. He was dismissed on Sunday afternoon, less than 24 hours after the Sabres finished a second straight disappointing season in his tenure. It was yet another coaching change by a team that has had a variety of problems in recent years. Since Lindy Ruff left early in 2013, the Sabres have gone through four coaches. Number five will be arriving at some point in the near future. Sabres general manager Jason Botterill said in a news conference Sunday that the team’s second-half problems ultimately forced him to make a move. The search for a new head coach is already underway according to Botterill. The Florida Panthers and Los Angeles Kings also fired coaches Sunday afternoon, and other teams have decisions to make in that area. Therefore, the competition for potential candidates is liable to be intense and immediate. For example, rumors connecting former Chicago coach Joel Quenneville and the Florida job surfaced on Sunday. Botterill said owners Terry and Kim Pegula were not involved in the decision to dismiss Housley. They were told of the plan earlier on Sunday, and then Botterill broke the news to Housley directly. “I did not look for the players’ input. It was my decision,” the general manager said. When Housley arrived in the summer of 2017, replacing Dan Bylsma, he was considered one of the hot candidates to become an NHL head coach. He had been an assistant coach in Nashville, which had done well. Housley also had an obvious connection with Buffalo, having spent eight years as a player here. Did that play a part in his hiring here? Hard to say. Bylsma, meanwhile, was not a popular figure among the players here. When he and then-general manager Tim Murray were fired, task number one certainly was to get everyone on the same page. However, the combination of Botterill and Housley still haven’t equaled the 78-point total that Murray and Bylsma recorded in 2016-17. In 2017-18, the Sabres finished last overall in a dreary season that saw them finish with only 62 points. The only good part of the season came when it was over with the addition of the first overall draft choice, Rasmus Dahlin. Buffalo got off to a good start the following season, thanks in part to the acquisition of such players as Jeff Skinner. The Sabres had a 10-game winning streak centered in November, which put them in first place in the overall standings. Housley was discussed as someone who could be a candidate for coach of the year honors. The win streak was followed by five straight losses, bringing everyone down to earth. Still, the Sabres were in the midst of the playoff race in mid-February, and they appeared to be headed toward a good-sized improvement in their point total for the season. Then came one of the worst stretch runs in Sabres history, perhaps the worst. Through a 24-game string that ended with a loss to Nashville on Tuesday, Buffalo was 3-18-3 – and only one of the wins came in regulation time. After playing like a team that could have reached the postseason for more than four months, they played like the original Kansas City Scouts for seven weeks. Wins over Ottawa and Detroit – the first two-game win streak since December – couldn’t erase that. Buffalo finished with 76 points, 16 games under .500. The Sabres had the worst record in the league since that 10-game win streak, a span of four months. The crash was a little too painful for many of the fans, who almost came across as hurt that their hopes were raised for the first time in years – only to see them thoroughly dashed. You could almost hear people say, “We believed again … and you crushed us.” The coach is always the first target in such situations. It would have been difficult to sell tickets over the summer to those fans had Housley stayed – even if the fanbase has remained remarkably loyal over this long dry spell. Certainly Housley wasn’t dealt the best of hands during his tenure in Buffalo. Only Jack Eichel, Sam Reinhart and Skinner were consistent scoring threats up front this past season, as the team’s other three lines were spotty at best. Botterill still remains “100 percent” confident that the Sabres can re-sign Skinner, who will be a free agent this summer. The defense’s depth was suspect, and the goaltending was often mediocre. The laundry list of needed improvements is a long one, even if some prospects are already in the pipeline. Still, when a team plays poorly for a long period of time, you don’t fire all of the players. A coach only has so many moves at his disposal, such as changes in line combinations/defense pairings and personnel moves concerning Rochester. We don’t know what was going on behind the scenes either. Now the search for a replacement begins. We’ll have to see who might be available, and who might be interested. Considering the Sabres’ recent history, those lists might not overlap completely. The Sabres haven’t been in the playoffs since 2011. There’s plenty of fault in that statement to spread around to everyone connected with the franchise. Until someone figures out what the ultimate reason behind the team’s poor play is, it won’t matter who the coach is.